This is what the “next level” looks like. 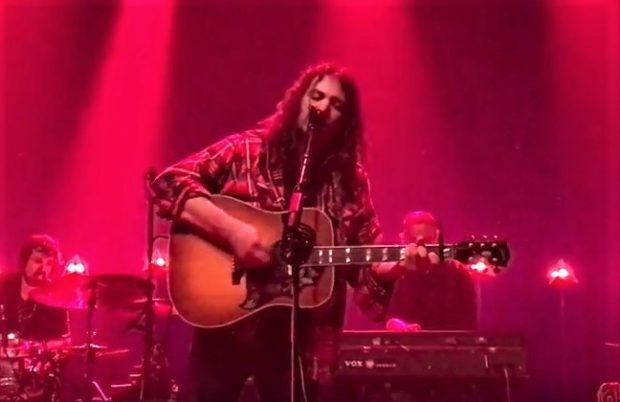 On the heels of the release of their 2017 major-label debut, A Deeper Understanding, The War On Drugs showed up for a two-night stand in New York, first at a packed Terminal 5, to be followed by a sold-out Central Park Summerstage on this Friday night. If the band’s Radio City show in 2015, right after they signed with Atlantic Records, portended what was to come, here we were, in the thick of the actual next step. I won’t retell the story from that 2015 post, but it’s worth a read if this is your first time with a War On Drugs recording from this site. Being on a major label, or selling out lots of bigger shows, doesn’t signify whether a band is “good” or not, or worthy or not, of course. In fact, this part of the process can be a nasty trap for many musicians — anyone who knows anything about Nirvana or a zillion other bands can tell you that. But in the case of this band, the product of years of hard work, with a wide-open, intricate sound that screams for a bigger stage, it’s the right result, and it’s one that validates Adam Granduciel’s songwriting efforts in particular. Granduciel is the perfect vehicle for big-tent lyrics, writing songs that are both personal and universal, and the sound he has developed is of a piece with that. Beginning with Lost In A Dream, and continuing in a major way with A Deeper Understanding, War On Drugs albums have a precise, densely arranged, melodic sound with an almost otherwordly sheen to it. Of course, what’s funny about that is that it’s so unusual today. If you grew up in the 1980s, or listen to much music from that era, having albums that sounded good was table stakes for even cult-favorite bands. Studio budgets, and album sales, were different then. Many fewer bands show up these days with fourteen instruments credited to a single track — nearly half of them, in many cases, played by Adam Granduciel. To reference the 1980s, and stalwarts like Tom Petty and Springsteen in particular, is not to malign this band at all. If anything, this show at Terminal 5 underscored that The War On Drugs are rightful heirs to that personal-yet-massive rock style. Like the best of their forebears, The War On Drugs are also able to translate their studio sound to the stage. Perhaps in a nod to many of the newer fans in the audience (one of us got asked if we first heard of the band on NPR), this set focused exclusively on the last two albums, and the band was so dialed-in they could very well have been playing the album over the PA. Of course, that would have deprived us of the added guitar pyrotechnics, and the joy of realizing, for the umpteenth time, that even in 2017, a band comprised of talented musicians of limited gimmickry but exceptional live performing skills can still make it big, can still mean something to people who these days are more accustomed to “musical precision” coming from an Ableton Live setup. In this broad-reaching survey of the band’s last two albums, the band’s other most remarkable quality — consistency — was evident, to the point that it’s almost impossible to focus on a highlight. But for me, The War On Drugs song that will always best-represent this evolution in the band’s journey is “Under the Pressure,” which so elementally captures both Granduciel’s mindset in the making of Lost In A Dream, but also in many ways the enormous weight of the band’s current success. It’s another of those songs with specific meaning to its author that is also able to capture an almost-universal anxiety among its listeners. To see a band that we personally have liked and supported for so long reach this point — not only making it to this proverbial “next level” but thriving against the pressure — is a special and rare thing. To hear, even in the relatively few snippets of stage banter on this night, how they remain the same people who played in tiny bars ten (or even six) years ago, is rarer still. I have to acknowledge, briefly, that I realize this band doesn’t “need” the support of a website like this, but their treatment of us as fans, both in the past and today, says a lot. We appreciate it. We each recorded this set from our usual location directly at the soundboard, acidjack’s with Schoeps MK41V microphones and nyctaper’s with Neumann KM150s. The sound quality of each is excellent, and both versions are offered here. Enjoy! Special thanks to The War On Drugs, their management, and the Terminal 5 staff for allowing us to record the show. Both recordings sound great, thank you!